or a visit to the Community Memorial Museum of Sutter County. People are drawn to the Sutter Buttes, whether they live in the area or are just passing through. They are a ten-mile wide circle of volcanic peaks that are dramatically isolated in the center of the Sacramento Valley. 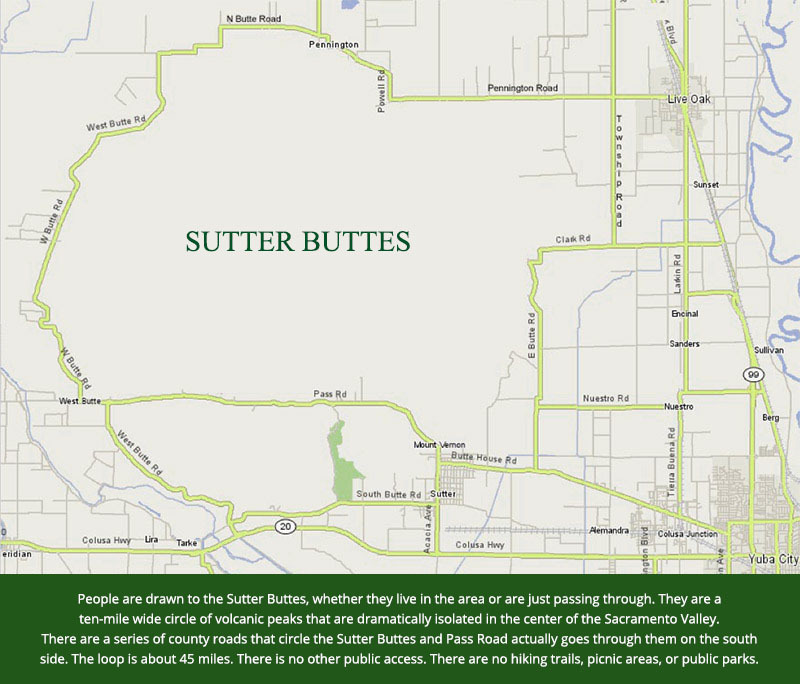 There are a series of county roads that circle the Sutter Buttes and Pass Road actually goes through them on the south side. The loop is about 45 miles. There is no other public access. There are no hiking trails, picnic areas, or public parks. Middle Mountain Interpretive Hikes offers guided interpretive outings on several properties in the interior of the Sutter Buttes. These outings are held from late October through early-May. They are posted on this website in early October for the Fall Season and early February for the Spring. Outings are $35 per person unless otherwise stated in the description. To sign up, email or call 530-671-6116 and leave a message. Middle Mountain Interpretive Hikes advances the understanding of the natural and cultural features of the Sutter Buttes through interactive educational activities for school children and the public.